Cloves (long) can be used in cooking either whole or in a ground form, but as they are extremely strong, they are used sparingly. Cloves have following health benefits. Cloves promote Digestive Enzymes Secretions and boost digestive functioning and enhance digestion and absorption of food. Licking the powder of fried cloves mixed with honey is effective in controlling vomiting. relieves the irritation in the throat and stops cough in the pharyngitis - that is, inflammation of the pharynx. Clove is an effective remedy for asthma. A teaspoon of decoction prepared by boiling 6 cloves in 30 ml of water can be taken with honey thrice daily as an expectorant. 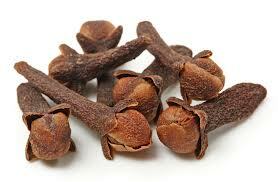 The use of a clove in toothache decreases pain. It also helps to decrease infection due to its antiseptic properties.